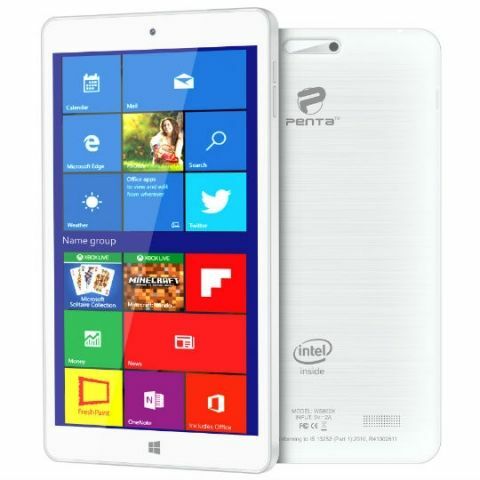 Pantel Technologies has launched the Penta WS802X tablet in partnership with Intel and Microsoft. The tablet is priced at Rs. 5,499 and is exclusively available on HomeShop18. The WS802X is India’s first tablet with an 8-inch IPS display. The device is powered by a 1.3GHz quad-core Intel Atom Processor with 1GB RAM. It comes with 16GB of onboard storage which can be expanded by up to 64GB. The device runs Windows 10 Home and comes with a 4000mAh battery. The tablet also comes with a free keyboard and Bluetooth mouse. Pantel Technologies in partnership with Intel & Microsoft has launched India's first Windows 10 tablet with 8-inch IPS display called Penta WS802X. This tablet is exclusively available on HomeShop18 at just INR 5499. The Penta WS802X is powered by a 1.3GHz quad-core Intel Atom Processor coupled with 1GB of RAM. The tablet features an 8-inch IPS display (1280x800 pixels) resolution. The Penta WS802X comes with 16GB of inbuilt storage that is further expandable via microSD card (up to 64GB). It sports a 2-megapixel rear camera that can record amazing videos. There is a 2-megapixel front-facing camera also onboard. The WS802X is backed by a 4000mAh battery that is rated to deliver long lasting standby time. Along with the rich features, tablet is also coming with free keyboard and Bluetooth mouse of worth INR 2000. The tablet offers plenty of connectivity options including Wi-Fi, Micro USB Port, Bluetooth, USB OTG function, 3G on USB Dongle. For more information on WS802X, log on to Grab the Future, an online marketplace for Penta products. Penta WS802X is exclusively available on HomeShop18 at just INR 5499. Upgrade Windows 8.1 Pro to Windows 10 offline?